Very Good. 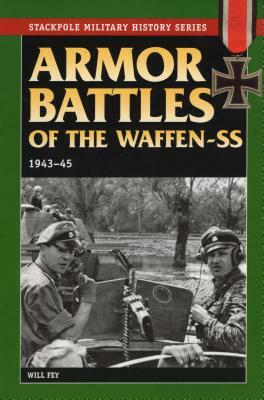 Armor Battles of the Waffen SS: 1943-45 (Stackpole Military History Series) by Fey, Will, 2003-05-08. Trade paperback (US). Glued binding. 374 p. Contains: Illustrations, black & white, Halftones, black & white, Maps. Stackpole Military History. Very good. Trade paperback (US). Glued binding. 374 p. Contains: Illustrations, black & white, Halftones, black & white, Maps. Stackpole Military History. Audience: General/trade. Very Good. No Jacket. Size: 9"; NOT an ex library book. Book has some curling at corners, light creases. Clean interior pages. Near Fine. 0811729052. A nice, bright copy. ; Stackpole Military History Series; B&W Illustrations and plates; 8.9 X 6.0 X 1.2 inches; 374 pages.